This post was created as part of a relationship in which I was sponsored by Weight Watchers and given a free three month subscription to try their new Personal Coaching and Essentials product, watch their Super Bowl “All You Can Eat” commercial and share my experience. Though I was compensated for my time and commitment, all views, positive and negative, are my own. 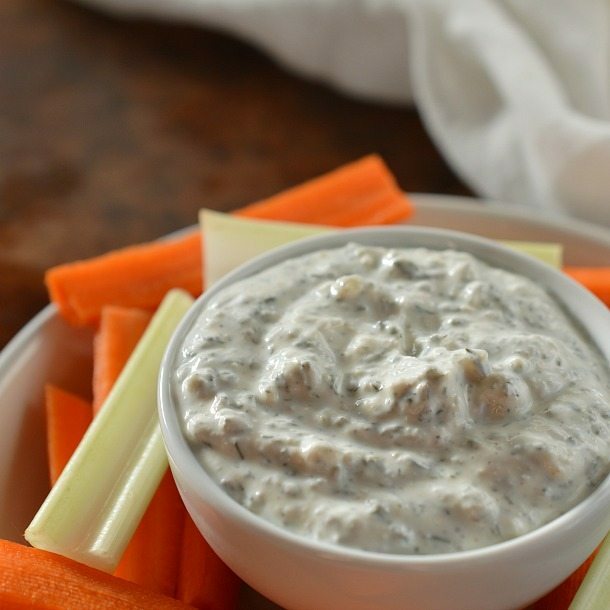 Looking for an appetizer recipe that you can feel good about eating? 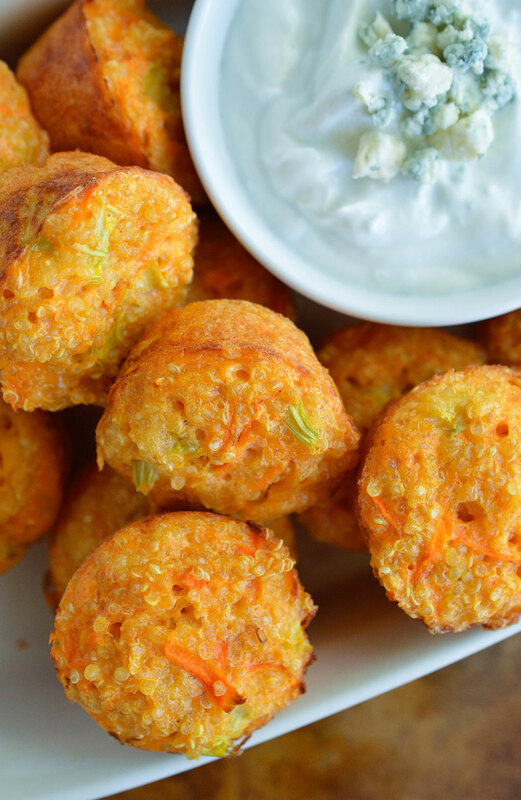 Then these Quinoa Buffalo Bites are for you. Baked quinoa with the flavors of Buffalo chicken wings and served with Greek yogurt blue cheese dip. 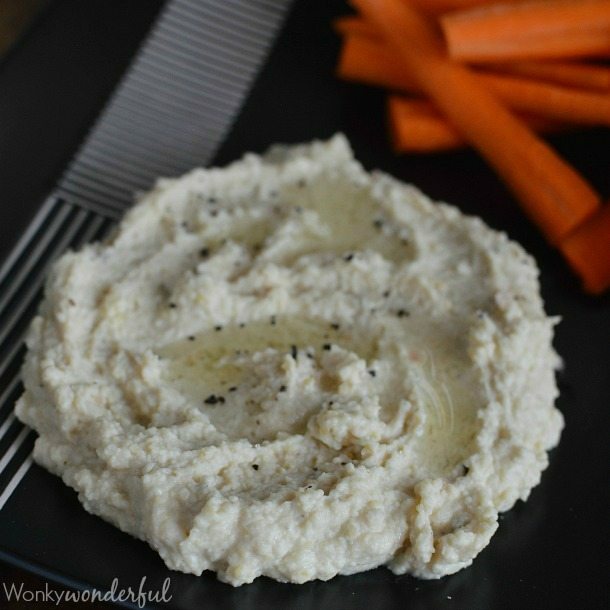 This appetizer is nutritious, gluten free and vegetarian! 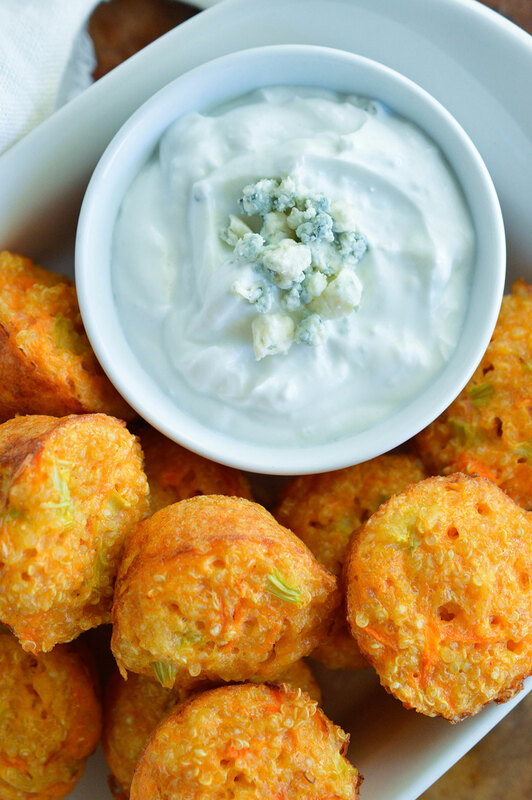 These Quinoa Buffalo Bites are what I serve on game day! Okay, I’m totally lying. I don’t watch football. But if I did, these would definitely make the menu! It can be difficult to stick to an eating plan on the big game day. All of the fried food, cheesy dips and carb-loaded appetizers are hard to avoid. Endless Buffalo wings, bacon wrapped bacon and deep fried cheese. I can easily eat a weeks worth of calories in one afternoon. Food is everywhere! And there is so much of it. You may have seen the new Weight Watchers commercial about our “All You Can Eat” society. Weight Watchers now offers OnlinePlus and Personal Coaching. You can get live help from a coach 24/7. Are you ready? Weight Watchers has a special offer for you. I have been using Weight Watchers Personal Coaching to maintain my weight loss. It is really helping to keep me focused and on track. I am more aware of portion size and my food intake. It isn’t about counting calories or deprivation. I am learning to make better food choices while balancing my diet. 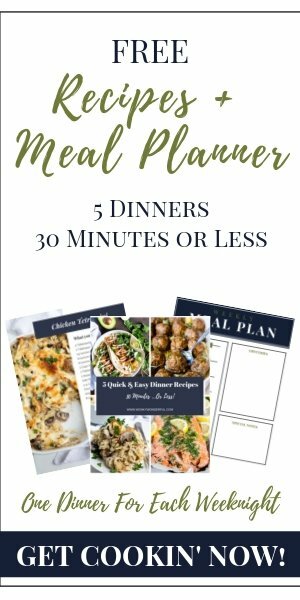 If you need Help With The Hard Part, give Weight Watchers a try. And make a batch of these Quinoa Bites! They are only 1 WW Point per serving! 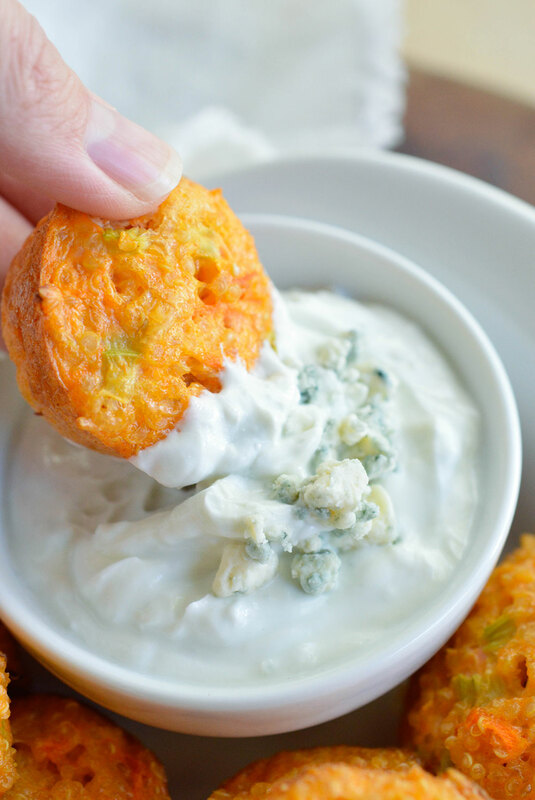 Combine Greek yogurt and blue cheese. Stir vigorously to incorporate. This recipe makes 12 quinoa bites. Each Quinoa Buffalo Bite equals 1 Weight Watchers Point. The entire batch of Blue Cheese Dip equals 4 Weight Watchers Points. More Healthy Snacks. . .
1 pt per bite? That’s amazing! 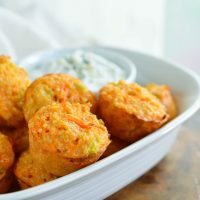 These Buffalo Quinoa Bites look so tasty! Thanks, Alida! I’m obsessed with Buffalo Sauce and Quinoa!!! I need to dream up an occasion to make these…like, it’s Thursday night or I finished all of the laundry today. 🙂 Seriously, I could eat these little bites any time of the day! What delicious, spicy nibbles!!! Love this! I have leftover quinoa in the fridge and am obsessed with Buffalo sauce! Guess what’s for lunch tomorrow! Pinned to my Quinoa Obsession Board! 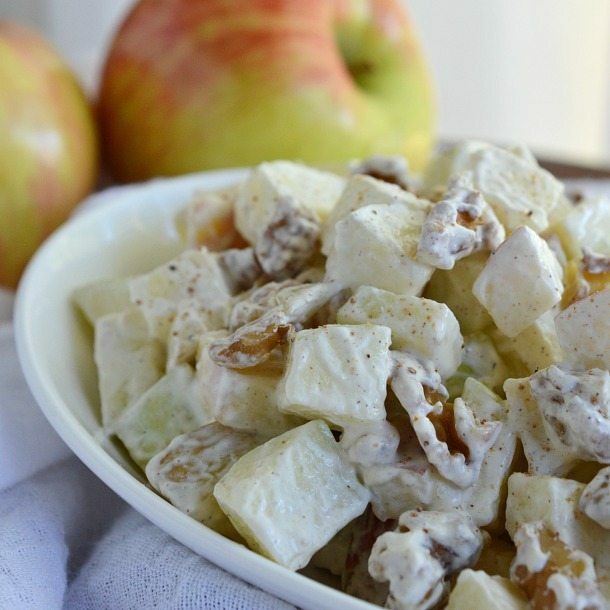 oh I just love recipes that look totally indulgent but aren’t. These are going on the top of my list to make! Love how moorish and addictive these little quinoa buffalo bites look. Love savoury nibbles like this! I had no buffalo sauce, so i used my homemade bbq sauce, and substituted 2 egg whites to cut the fat even further. The flavour was good but the muffins stuck to the pan. Not sure why, but I love a 1 pt side dish. Thanks for the recipe. Your changes sound delicious! Every pan seems to be different. Next time try greasing your pan with extra nonstick or oil. Do you cook the quinoa and then use 1 cup of the cooked quinoa or is it one cup of uncooked quinoa, cooked? I took it as one cup of already cooked quinoa. I ended up not having enough for all 12 muffins. Oops! can we make this without cheese. I’m on a diet and I can not eat any cheese? The cheese helps to bind it all together. If you decide to give it a try without cheese the may just break apart easily is all. They were a bit vinegary for me, but I love the base. I’m thinking I may use Sriracha next time, or go with a parmesan/Italian twist. I think there’s lots of room for experimentation! Thanks for the recipe! I get they are 1pt each, what is the calorie count? OMG delish! I made mine with sriracha since I didn’t have buffalo sauce. I plan to make another batch tonight.